This cosy cottage makes an ideal base for exploring the famous beaches of the stunning Gower Peninsula. It is situated on the oldest street in the village overlooking Swansea Bay.The promenade, ice-cream parlours, bars and restaurants are all within easy walking distance. From here you can walk into the village or on to the walking paths taking you to the nearby beaches of Rotherslade, Langland and Caswell or you can drive to one of the many stunning beaches on the Gower Peninsula, including world famous Three Cliffs Bay and Rhossili. The cottage offers comfortable accommodation with a double bedroom, small bunk bed room and open plan kitchen and living room area with woodburner. The patio at the front of the house offers space to enjoy a BBQ on sunny evenings. The cottage has everything you will need for a relaxing or adventurous break. Please note that the cottage is situated on a hill with beautiful sea views however as a result, it may not be appropriate/accessible for all. Please note that due to the unique location, there is no driveway at the cottage however it is possible to unload your car directly outside and parking is available on street nearby. Lovely cottage as advertised, very nicely furnished. Great location although the price of that is the big hills! Good secure garden for our dog. We would stay here again. Had a lovely weekend in this lovely cottage. Well equipped and comfortable. Really handy for all the bars and restaurants in Mumbles. As it was our 40th wedding anniversary the owners left us a card and chocolates which was very thoughtful. Lovely cosy cottage, well equipped. Good base for travelling around the Gower. Need to be fit as cottage on a very steep hill. This was our third stay and we will be back. The cosy cottage at the top of Village Lane was absolutely perfect. A great base where we could relax after visiting local sights and eateries. We parked the car nearby on Higher Lane with no problems at all. 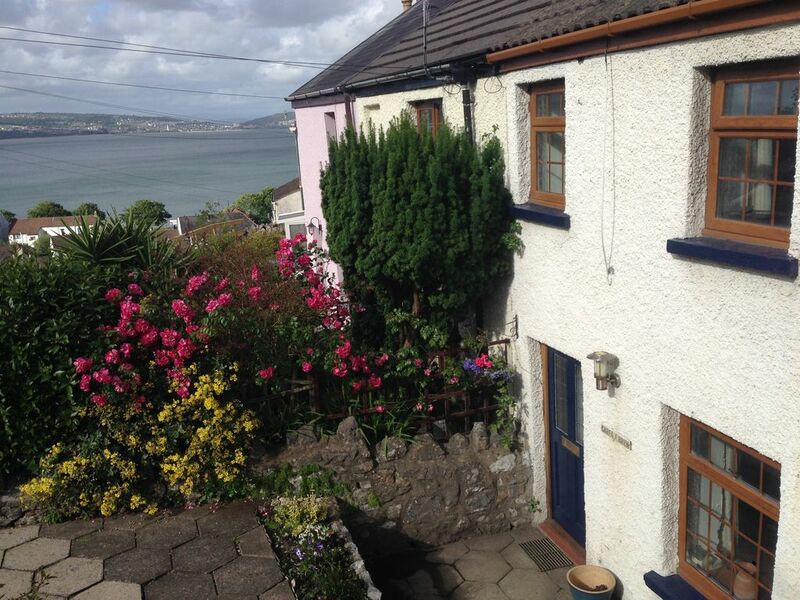 I would definitely recommend the cottage for a stay in the Mumbles. The cottage was easily found although parking tricky, we were given excellent tips on where to park. Location ideal for the town, seafront and coastal walks- cosy woodburner to come home to. Cosy bedroom, comfy bed, superb shower with plenty of hot water. Everything you could need. Hosts local and on hand without being pushy. Absolutely adored the house and location. Plenty of great places to eat. Local shops 2mins walk away. Local pubs very friendly. Everyone loved our two spaniels and had so many warm welcomes wherever we went. Coastal walks towards Gower excellent. Loved walk to Brandy Cove. Would definitely recommend and hope to return. The cottage was truly cute and cosy. All information supplied was correct, unfortunately I didn't read correctly about there being a no entry sign off the main road up Village Lane but found our way on the road before by the Irish pub, (this lane is also not quite so steep to walk up than Village Lane neither). Brilliant location, centre of bot points of the Mumble, pier and shops. Only negative was difficulty unloading/ loading car outside the cottage, every car in the area seemed to appear when I was parked outside and lanes were quite narrow, be very careful of ditches on side of the road. I was also looking for the number in Village Lane but should have kept a note of the cottage name and I should have read the arrival notes more clearly. Views over Swansea/ Mumbles bay were amazing, every time we went out we were all stopping to admire the view, day and night. Living room and kitchen were lovely and log fire were fantastic, everything that we needed. I had expected 2 toilets but there was one toilet upstairs and a separate shower room downstairs. Cottage was lovely and clean and nicely decorated. We all agreed (4 adults, 1 was ok with being on top bunk) that we would happily stay again, very relaxing, thank you. The cottage is centrally situated in the pretty and vibrant village of The Mumbles, walking distance to shops and restaurants and within easy reach of a range of stunning beaches along the Gower coastline. Low Season rate excludes Christmas and New Year 2016. From 17th December to 7th January inclusive, the weekly rate will be the same as high season at 550 pounds per week. Minimum stay is 3 nights.